We all love to have a chat on two way radios; whether it’s with fellow travellers about how fast or slow they may be travelling, to strangers about road conditions, station workers about accessing land or even with emergency services. Regardless how you use your UHF two way radio, one thing is for sure, it’s a damn pain when you can’t hear each other properly. That is generally from two main causes; either you’re simply out of range or lack of sound quality and volume coming from your radio or hand piece. Often, no matter how high you turn the volume up, all you get is louder muffled noise as the base radios speaker is mounted within the dash or near the foot well. While some radios had an optional remote speaker, many units didn’t accept that option. The alternative was a controller handset with built-in speaker, which allows the base unit to be more compact and easier to find a spare piece of real estate on your dash or console. This still raises the problem of sound quality; you’re holding the mic and speaker with your big sweaty mit, inadvertently blocking the sound or alternatively having to hold a mic that is too large. Not so with the latest from GME – the TX3350 which features the fancy name of ‘Soundpath™’. What the clever engineers at the Australian born and bred GME radios have managed, is to ‘project’ the sound out and away from your hand to allow clear and unmuffled sound from the quality inbuilt speaker of the hand held microphone. Not only have they achieved the sound quality, they have also managed to produce an ergonomic full function LCD to control all features of the base unit – a top effort in miniaturisation! That’s the exact reason for my choosing this GME radio; the head unit can be tucked away out of sight under the dash, within your console, under a seat or any other hidden space you may have. The unit also comes with an extension lead from head unit to mic, so you really can get creative on where it’s fitted. Obviously, the hand piece is mounted on a traditional mic clip, but you simply don’t need optional extra external speakers with this unit. Regurgitating a little of the GME specs page for those that must know; the TX3350 features: Digital Signal Processing for Pure Sound, full-function LCD SoundPath™ speaker microphone, user selectable / adjustable open and group scan, squelch, duplex channels, and priority channel, plus 104 in-built DCS codes, 50 in-built CTCSS codes, 5 digit selcall with quiet mode and importantly, a huge five year warranty and is Australian designed, engineered and manufactured. 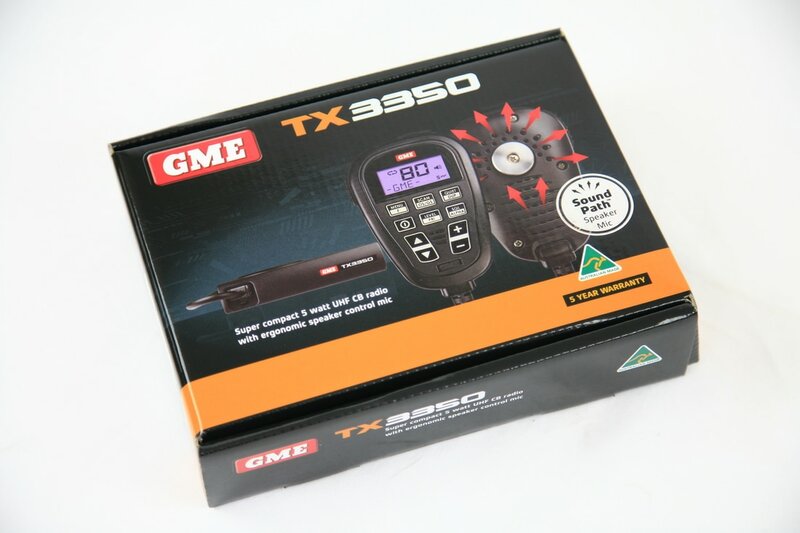 I reckon after having used the GME TX3350 for just a few weeks, that it’s the Ducks Nuts of UHF radios. I didn’t need the extension lead as I’ve semi-hidden the head unit under the centre dash and hung the mic smack bang where both my gangly arm and my passenger can easily reach it. Something I’ve found over the years with some ‘loaded’ hand held mics is the annoying ease of accidently pushing buttons while using the mic. Sometimes I’ve unintentionally changed channels while talking, other times I’ve inadvertently turned the volume way down leaving me to ponder why no one wanted to talk to me! Not so with the GME TX3350 with SoundPath™ speaker microphone; the ergonomics of the handpiece negate the accidental button pushing, so top marks again to the designers. Antennae-wise, I’ve opted for a GME AE4705 unit that measures 1200mm long, has 6.6 dBi gain, is ground independent and came complete with a sturdy spring base. The fibreglass whip is easily removable should I wish to use shorter (for hilly country) or longer (for flat country) whips to suit different terrain. Same goes for the super-rugged heavy duty stainless steel spring mount; I had the same on my last Cruiser and while it relieves and soaks up the stresses of corrugations and pot holes, it doesn’t flop all over the show like a pansy in a gale. All up, I reckon I’ve got a brilliant UHF set up, that’s been designed and manufactured in Australia for our conditions. The compactness of the head unit belayed my fears of squeezing it into my dash and the handheld unit delivers quality easy-to-hear sound. Other than learning which button does what… it’s a beauty! Now all I need to find… is someone who’ll listen to me!